Hi all. I'm about to get my 1st oil change in my 16 1.6T Sport. Should I go synthetic?? You will get many answers. I started using full synthetic on the first oil change. 1) don't drive the car hard until 2-3 minutes after the t-stat gauge has showed that it's warmed up. 2) do not turn off your engine immediately after spooling up your turbo, wait at least 30 seconds. With direct injection and turbo I recommend synthetic. It can handle hot turbos and DI byproducts better than conventional oil. And on sale it is about the same price as regular dino. Also most synthetic products are now formulated to deal with the potential low speed pre ignition problems that could occur under certain conditions in these engines. I've heard that once you have enough miles to have properly broken in your engine, (seated the rings etc). Then after, it's ok to go with synthetic oils. Various engines come factory filled with synthetic. Engines will break in on synthetic. Since its a turbo, and a Hyundai, my recommendation is a 5w40. Have been using Pennzoil Ultra Platinum 5W-30 however, may use Mobil 1 0W-40 upcomming oil change. Believe using 0W-40 may cut down on gas mileage however, better at keeping turbo cooler. Just a follow up if any member has used Mobil 1 0W-40 oil instead of 5W-30? I have used M1 5w30, 0w30 and 0w40 in my Gen Coupe. Fuel dilution is an issue with my engine though so I go with the 0w40 all the time now. 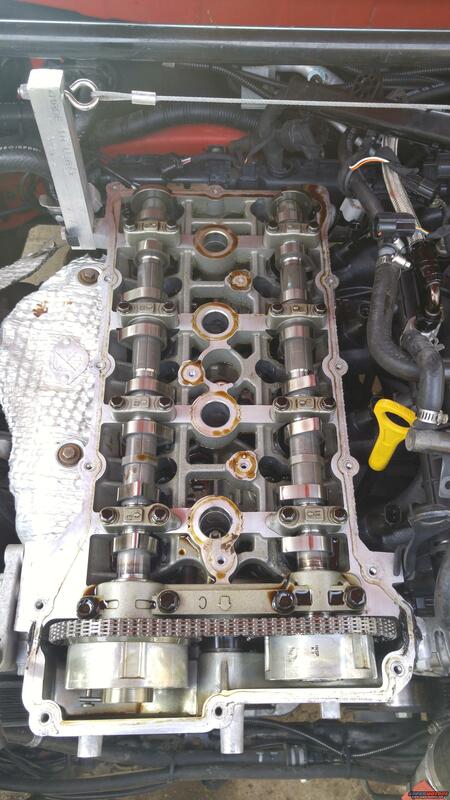 Camshafts are clean as can be at 97k miles. Red Raspberry, thanks for the reply and posting the photo, much appreciated! Were any noticeable changes observed when you switched from the 5w30 to 0w40 (slight decrease in MPG etc.? I understand engine you have is the 2.0 GDI turbo (2010 Genesis Coupe), so if the recommended oil requirements / specs are similar to the 2016 1.6 GDI turbo engine.